Jay Sadler saluted the spirit his Pompey Women troops displayed after battling from behind to defeat MK Dons. The Blues fought back from a goal down at half-time to win 3-1 at Stadium MK on Sunday. Charly Wright had opened the scoring for the hosts but second-half strikes from Rachel Panting, Daisy McLachlan and Katie James earned the visitors a first success in five matches. 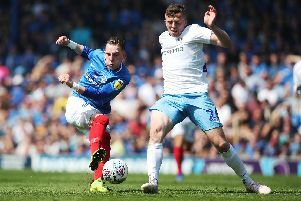 Sadler believes Pompey lacked creativity in the final third in the first half. However, the manager was delighted with his side’s reaction after the interval and felt they could have scored more goals in the end. He said: ‘At half-time we came in and I think we were bitterly disappointed as we obviously didn’t have a foothold in the game having had a lot of possession. ‘I didn’t think in the first half that we created enough in the final third. ‘We lacked that bit of spark, that little bit of cutting edge. ‘The reaction was superb with Rachel Panting scoring and then we went for it. ‘The second goal was a delight, great combination play and the third was a superb ball in. Before their victory, the Blues had suffered four straight defeats. In their previous game at Watford, Pompey lead with 15 minutes to go but suffered a 4-2 loss. However, Sadler felt his players learned from that experience and hailed the character his players showed to bounce back at MK Dons. The boss added: ‘We were 2-1 up against Watford with about 15 minutes to go and unfortunately didn’t manage that game appropriately. ‘The goals were smart at MK Dons and they knew when to continue their attacks and when to fall into a medium block and see out a bit of pressure. ‘It’s a credit to them not to have done it the week before and then dig in this week. Pompey travel to Poole Town on Sunday in the FA Cup and those on the fringes of the squad are expected to get their chance to impress. Saddler said: ‘We’ve got an abundance of talent that we didn’t use at MK Dons. ‘Against Poole, there will be opportunities for the girls who didn’t feature to stake a claim and wear the shirt.